An amazing new find of mammoth fossils at a San Diego housing development could shed more light on what the Ice Age was like in this part of the world. Workers in San Diego County have stumbled upon an amazing new discovery while working on a housing development: they found bones of mammoths, ancient bison, and other creatures dating back to the last Ice Age that could help shed light on what California looked like between 50,000 and 200,000 years ago. As we reported recently, construction workers in Carlsbad, California, unearthed the bones while moving earth for a housing development that would have included hundreds of new homes, and the work was put on hold so paleontologists could carefully excavate the fossils and send them to a local museum. They found mammoths, horses, turtles, and a prehistoric bison. The bones date to the Pleistocene Epoch, also known as the Ice Age when the Earth was covered in ice. So what kind of world was California like when these ancient beasts were roaming the Earth? It was certainly a very cold place, for one thing. The Pleistocene glaciation began about 1.5 million years ago when the Earth received less of the warming radiation from the sun, according to a Business Insider report. At one point, a whopping 30 percent of the Earth was covered in ice, including the entirety of the United States today. That means that California, which doesn’t see much snowfall at all and is currently ensnared in a crippling drought, was at one time an icy landscape. The glaciers advanced all the way to the southern San Bernadino Mountains. The ice age finally ended between 15,000 and 25,000 years ago, and then there was a warm period and these glaciers started to retreat, leading to the climate we have today that allowed humans to begin moving about the world and colonizing everywhere, no longer confined to regions in Africa. 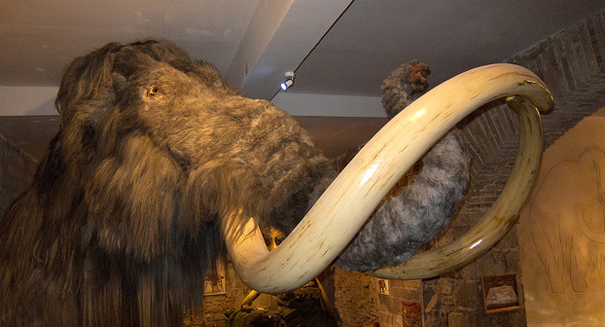 It’s hard to imagine it, but at one point just tens of thousands of years ago, California probably resembled a frozen wasteland, with giant furry elephants known as mammoths roaming its expanse — a very different place indeed.